HABIT: Low growing, spread by runners. Bronzy-purple leaves and purple flowers on short stalks. It’s pretty when healthy but rarely is. Native to Europe. CULTURE: Well prepared beds with good drainage. Fairly high water and fertilizer requirements. Hardiness Zones 3 - 9. 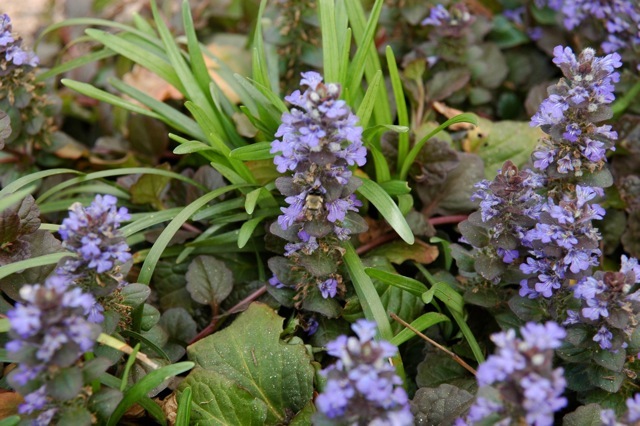 USES: Ground cover for small areas. PROBLEMS: Nematodes are a real problem. Do not invest much money in this plant.